Ready-made solution to the problem D4 Option 12 from Reshebnik on theoretical mechanics (termehu) Taskbook Targ SM 1983. 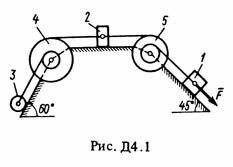 The mechanical system consists of the weights 1 and 2 (the coefficient of friction of the cargo plane f = 0,1), the cylindrical roller uniform continuous stepped pulleys 3 and 4, and 5 degrees with radii R4 = 0,3 m, r4 = 0,1 m, R5 = 0.2 m, r5 = 0,1 m (weight of each pulley assumed to be uniformly distributed along its outer rim) (Fig. D4.0, D4.9, Table. D4). Body systems are interconnected filaments wound on the pulleys; Lots of threads parallel to respective planes. Under the force of F = f (x), which depends on the movement of the force application point, the system is set in motion from rest. When driving the system on pulleys 4 and 5 are constant moments of resistance forces, which are equal to the M4 and M5. Determine the value of the required quantity at the time when the movement of the force application point F is equal to s1. Immediately after payment you will receive a link to a zip-archive with the solution of the problem D4 Var.12 on the theoretical mechanics of Reshebnik Targ SM 1983 for part-time students.